Plumeria's are a member of the Apocynaceae (Dogbane family). Plumeria obtusa is native to Columbia, Tropical America, from southern Mexico, northern South America and the West Indies, Plumerias are rated to be small trees, to about 15-18 feet and is seen in a variety of solid colors. 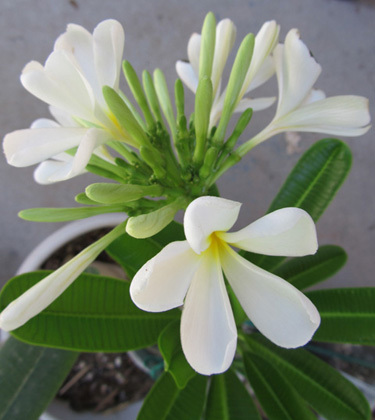 Plumerias can be divided into two main groups, the Plumeria obtusa and Plumeria rubra. Plumeria obtusa, Singapore Plumeria are considered to be nearly evergreen to evergreen the warmest climates and they have rounded shiny leaves that are dark green in color. Obtusa plumeria generally produce white fragrant flowers that are about 2 inches long, arranged in 5 petals, they are waxy and fragrant and they are borne in showy large clusters above the foliage. They blooms in spring and through all the summer months This plumeria grows upright with a umbrella shaped canopy and can reach 25ft in the warmest climates. In Arizona this variety is more sensetive to cold and heat. The trees will burn in the most direct sun exposures and these trees are best suited to be planted in areas that receive some afternoon shade especially durning the hot summer months. Plumeria obtusa, Singapore produced the flowers that have the famous Fragngipani fragrance used in perfumes they are pure white in color with a small brilliant yellow center and have no additional color bands on the front or back. The flowers average 3.5 inches in diameter on mature plants. The plants are densely branched with glossy dark evergreen leaves. The picture on the right is an example of a young recently rooted cutting we are growing here in Phoenix, Az. The young trees has green wood on the trunk and branches which become more gray as it matures. "Dwarf Pink Singapore Plumeria", which produces white creamy pink flower clusters on a dense small 4ft to 5ft tree. Although Rubra plumerias are more hardy and heat tolerant than the Plumeria obtusa, this variety can do quite well with the ideal conditions that protect the tree from the extreme Phoenix sun and temperature extremes. The ideal condition for an obtusa plumeria in Phoenix is filtered sun, such as under a larger tree that has a light canopy. In filtered sun it will get enough sun to bloom but will not be over exposed. 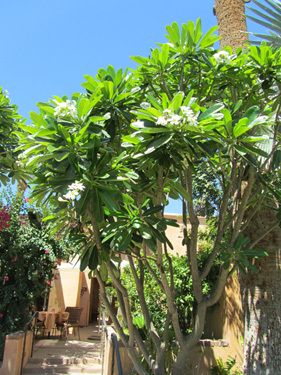 We have seen some large speciems of this variety growing in Phoenix, such as this large "Singapore Plumeria pictured at left growing at the Royal Palms Resort in Phoenix. These trees survived the big freeze of 2011 and are recovering quite well. Although this variety is considered to be evergreen in Tropical locations in Phoenix when the temperatures fall below 50 degrees for a extended period even the "Singapore" variety will go dormant and drop their leaves. Plumeria trees will grow much larger when they are planted in the ground a key to sucess with these plants is to have a well draining soil that prevents them from sitting in standing water and rotting. In our climate there are few pests that effect Plumeria, which means these trees are nearly pest free the only bugs that seem to attack the leaves are aphids and spider mites which can be controlled by insecticidual soaps and the damage they cause is primarly cosmetic and has no long term effects on the health of the plants. © 2011 - 2014, Pali Plumerias - All rights reserved.